2.USB1, USB2 outports can charge digital devices with 5V, 9V, 12V, and support quick charge. 4.All outputs of this product like DC-OUT,USB1,USB2, TYPE-C can charge several devices like laptop, tablet, cell phone simultaneously. 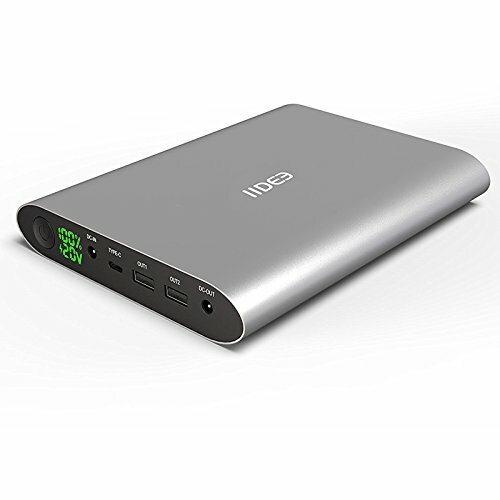 5.Charge for the 50000mAh Power pack Connect the charger with the DC input port,the other side connect to the adapter.The digital screen showing 100% means it is full charged. 6.Charge for your USB devices Press the button for 2 seconds to start up,connect the USB cable with output port,it will start charging your devices.The digital screen will light up and show the number of remaining capacity. 7.Charge for your TYPE-C devices Press the button for 2 seconds to start up,connect the TYPE-C cable with the TYPE-C output port,it will start charging your devices .The digital screen will light up and show the number of remaining capacity. 8.Charge for your notebooks Press the button for 2 seconds to start up,firstly, you need to confirm the device's charge voltage value, secondly,you change voltage value of this product same to your devices, finally, find your device's adapter, connect the DC cable with DC output port and your device, then it's ready to charge,the digital screen show the voltage of your device and the number of remaining capacity . 9.Battery capacity indicator Press the button for 2 seconds,the screen will light up to show the voltage and the number of remaining capacity. If the digital screen does not light up by press the button for 2 seconds,the power bank need to be charged. IIDEE six adjustable voltage and can charge digital divices for 5V, 8.4V, 9V, 12V, 16V (compatible 16.5V),20V (Compatible 19V,19.5V) USB1, USB2 outports can charge digital devices with 5V, 9V, 12V, and support quick charge. All outputs of this product like DC-OUT,USB1,USB2, TYPE-C can charge several devices like laptop, tablet, cell phone simultaneously. If you have any questions about this product by IIDEE, contact us by completing and submitting the form below. If you are looking for a specif part number, please include it with your message.